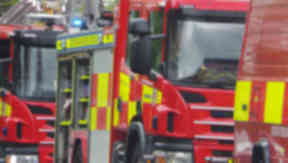 Emergency services were called to the blaze in Peterculter on Thursday afternoon. A woman has died after a house fire in Aberdeen. Four fire engines attended the incident, which was said to be in a "single-storey building". Police later confirmed a woman had died in the fire. A man who was helped out of the house was treated for minor injuries. An SFRS spokesman said: "The Scottish Fire and Rescue Service was alerted at 3.15pm on Thursday to reports of a building fire near Aberdeen. "Operations Control mobilised four fire engines to Peterculter's Anguston Road, where firefighters were met by a fire within a one-storey building."